EPCOR is a unique organization, one with many contradictions. It was founded from Edmonton’s power and water utilities, yet operates in other provinces and in the US. It is owned by the City of Edmonton, yet is not answerable to the public, and takes no operational direction from the City. The City has rejected privatization of EPCOR, and yet privatization attempts continue and EPCOR has issued shares that trade on the Toronto Stock Exchange. These contradictions raise the issue of EPCOR’s accountability. And at a time when the City of Edmonton is considering handing over its drainage system to EPCOR, consideration of accountability is urgent. Accountability and service of the public interest are topics that have been discussed in relation to government for centuries, and accountability mechanisms have been created, improved and refined. A renewed discussion of accountability, prompted by corporate scandals like Enron and Nortel, has brought the focus around to business enterprises. Publicly-owned business enterprises tend to have a broad set of accountabilities, and are often explicitly required to serve some aspect of the public interest. Direct public operation of an enterprise has the greatest degree of accountability, and enables full democratic control of the organization’s activities. The Crown Corporation model reduces direct accountability in favour of independent operations, but still has significant transparency mechanisms and public interest mandates. Modern, large business corporations, in stark contrast, have one accountability - to maximize profits for shareholders. And despite the fervent wishes of the Corporate Social Responsibility movement, business corporations are legally unable to sacrifice profits to servesome other social or environmental goal. Proponents of the corporatization and privatization of publicly-operated enterprises often seek to justify their claims by asserting that regulation will be adequate to protect the public interest. However, in reality, regulationas a means of protecting the public interest suffers from a number of shortcomings in comparison with direct public operation of anenterprise. Regulation is often ill-informed due to information asymmetry, and it is inefficient. It is a blunt instrument that tends tocause collateral damage and thus is used rarely. It is often ineffective at stopping the proscribed activity, and at achieving the ultimate policy goal. However, other business forms, such as sole proprietorships, partnerships and corporations managed by their owners, can serve public-interest goals other than profit maximization. And private sector, public interest enterprises, such as cooperatives and non-profitsocial enterprises, can be set up in a way that requires them to do so. Such public interest enterprises can be quite large and successful, andthey currently operate in many sectors, including utility management. EPCOR operates at the corporate end of the accountability spectrum;its primary accountability concern is in relation to shareholders and growth. On EPCOR’s board there is a lack of participation and oversight by City Council and other stakeholders. The utilities EPCOR controls are no longer the subject of democratic decision-making, and there is no requirement for public transparency. The City can not set the operational priorities and decisions of EPCOR utilities to further City priorities like environmental protection or wisely managed, cost-efficient development. Finally, direct accountability to the public has been curtailed, as the corporatized utilities are no longer subject to the Freedom of Information and Protection of Privacy Act. Key documents governing EPCOR's accountability relationship with the City are unavailable to the public. The above concerns respecting EPCOR’s low level of accountability and its focus on profit maximization at the expense of other public priorities are also applicable to the proposal to transfer the City's drainage services to EPCOR. Corporatization of drainage wouldgreatly reduce accountability, and the ability of the City to control development. The supporters of corporatization tend to downplay and disregard the above accountability concerns, instead advancing a number ofrhetorical contentions. They assert that transparency in financial reporting would be improved by corporatization, while ignoring the fact that the City can currently require whatever degree of transparency it wants, indeed more than EPCOR could provide. They assert that governance by board members would allow for utilization of valuable expertise, while ignoring the fact that the City can alsoemploy a board structure, and recruit exactly the expertise needed. They assert that corporate borrowing would be clean-cut and easy,while ignoring the fact that the City can keep utility and other program financing entirely separate, and can access cheaper financing than a corporation. They assert that marrying drainage and water management under one roof would be a "natural progression," while ignoring the fact that their coordination can be managed by agreements, as was pointed out in an earlier City Report supporting the organizational separation of water from drainage when EPCOR was formed. The utilities and the citizens of Edmonton are at an important crossroads. Corporatization of utilities is often used as a stepping stone to full privatization, and EPCOR is at risk of privatization. Privatization of EPCOR would mean the complete and final loss of the public’s control over the utilities. Utility rates (and Director andmanagement salaries) would no doubt increase, while profits and corporate control move abroad. Profit maximization would override the public interest in orderly city development, protection of the environment, and liveable wages to support families and communities. And if the City’s drainage service is handed over to EPCOR, the probability of privatization would increase substantially, along with the associated harms. 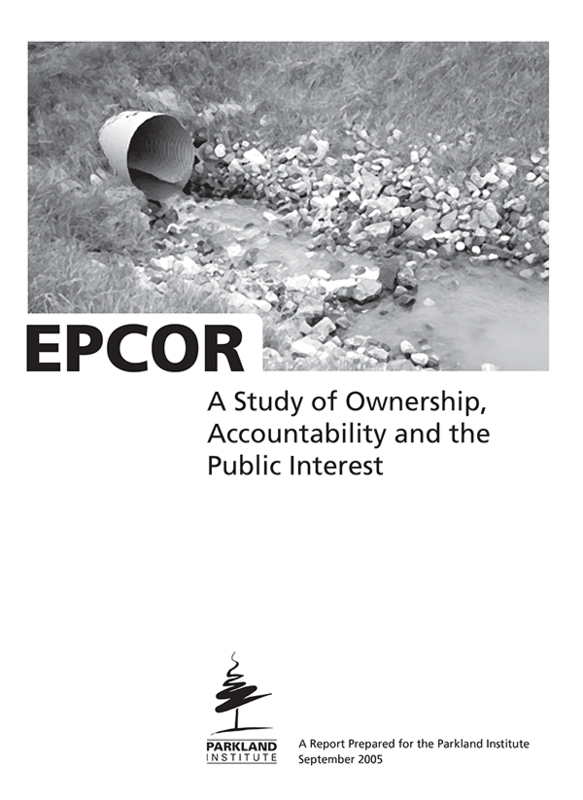 However, while the City continues to be the common shareholder of EPCOR, it is still in a position to preserve, and increase, the accountability and the public interest served by our utilities. Insteadof proceeding down the path of corporatizating drainage, the city could keep it on as a city function, and could seek to achieve any ofthe goals it identifies for drainage services within its current structure. appointing Councillors, consumer and other stakeholders to the EPCOR Board, and asserting its ability to approve operational plans and budgets and activities that could have an impact on City development plans and priorities. prohibiting both City Administration and EPCOR frominvestigating or considering further corporatization (or privatization). bringing EPCOR’s utilities back under City management, with fair operating rules (e.g. to prevent preferential regulatory treatment or taxpayer subsidy of the utilities) in order to ease concerns about costs and unfair competition. converting EPCOR into a Utility Cooperative, the owners of which would be the consumers in locations served by EPCOR. These and other options for increasing, rather than decreasing, the accountability of our utilities, are deserving of further study. It is vital that the City do so, while it still can. Photo credit: Bill Burris under a Creative Commons licence.